Excellent reproduction of the parking brake handle used on 1968-74 A-Body applications. Injection molded from the toughest polymer to create an almost indestructible part. Will fit earlier A-Bodies with the 9/16" shaft and roll pin configuration. Includes new roll pin. Reference Chrysler part number 2823 549. Nice reproduction of the clip used to secure the right parking brake cable to the rear axle housing on Dana equipped cars. Also used to secure the left parking brake cable to the car body on most vehicles. Formed from correct gauge steel and includes zinc phosphate 5/16-18 hex flange head bolt. Reference Chrysler part number 2534 931. Nice reproduction of the clamp used to secure the upper parking brake cable to the parking brake actuator on 1966-70 B-Body, 1970 E-Body, and 1970-75 A-Body cars. 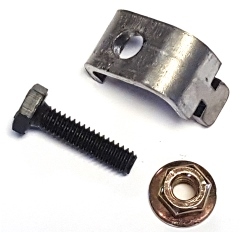 Formed from correct gauge steel and includes 1/4-20 hex head mounting bolt & correct yellow zinc hex coni SEMS nut. Reference Chrysler part number 2534 926. Parking brake actuator levers for 1962-75 applications with 10" rear drum brakes. Set includes pressed in pivot pins, a pair of zinc plated C-clips, and a pair of zinc plated wave washers. Reference Chrysler part number 2881 660-1. One set required per vehicle. Parking brake actuator levers for 1964-71 applications with 11" rear drum brakes. Set includes pressed in pivot pins, a pair of zinc plated C-clips, and a pair of zinc plated wave washers. Reference Chrysler part number 2260 800-1. 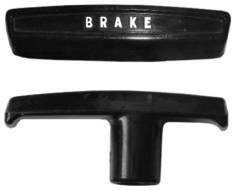 Parking brake strut levers for 1965-72 A-Body applications with 10" rear drum brakes. Set includes pair of strut lever springs. 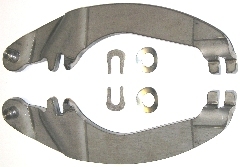 Right side lever stamped with "R". Reference Chrysler part number 2534 666-7. Parking brake strut levers for 1965-70 11" rear drum brake applications for all body styles. Set includes pair of strut lever springs. Right side lever stamped with "R". Reference Chrysler part number 2533 892-3. 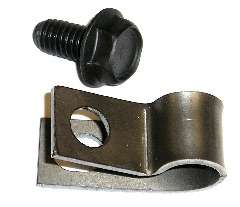 Parking brake strut levers for 1965-74 B & E-Body and 1973-76 A-Body applications with 10" rear drum brakes. Also used on 1978-79 L'il Red Express Trucks with 10" rear drum brakes. Set includes pair of strut lever springs. Reference Chrysler part number 2409 823. Parking brake strut levers for 1971-75 11" rear drum brake applications for all body styles. Set includes pair of strut lever springs. Right side lever stamped with "R". Reference Chrysler part number 3580 750-1. 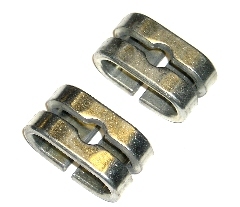 The ONLY 100% accurate reproduction available on the market of the parking brake cable rear connector. Made from the correct gauge ROUND EDGE material and clear zinc plated as original. Two used per car on 1962 A & B-Body, 1963-64 A, B, & C-Body, 1965 A & B-Body, 1966 A-Body, and 1971-74 A, B, & E-Body applications. Sold as a pair. Reference Chrysler part number 2071 094. 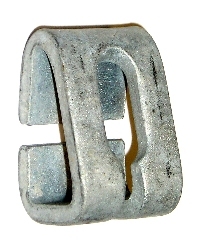 Correct parking brake cable front-to-intermediate connector for 1971 B & E-Body applications. Made from correct gauge material and hot dip galvanized like original. Reference Chrysler part number 3467 950.